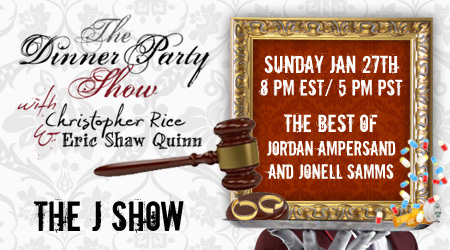 Guest Host Jordan Ampersand joins Eric Shaw Quinn for what we’re calling the J Show, but a lot of other names come to mind as well. Christopher had Jury Duty this week so this special LiveCast which otherwise might have been a Best Of Jo Nell Samms special, turned into a worst of Eric Shaw Quinn and Jordan Ampersand special. In short, it’s really special. Jo Nell fans will enjoy some of her best advice, and no matter how you feel about Jordan, there’s something here for you.